For quite some time now, I’ve been trying to pinpoint what the very best and most powerful TV box on the market is. I’ve used a variety of different TV boxes from different brands – they have different specs, different operating software, and different wi-fi capabilities. I was finally done trying out all the medium grade options and wanted to upgrade to one of the latest and fastest Android TV boxes: the SkyStream 3 Plus. When I stumbled upon the SkyStream 3, there were several aspects that kept on being mentioned about its performance: the 4K, the HDR, the flash memory, the sleek design, and on and on it went. I was certainly interested but I needed to try it for myself to see if it was the real deal. In this article, I will guide you through my personal journey with the SkyStream Three Android TV Box and give you my final conclusion on whether or not this really is one of the best TV boxes ever made. Before we really begin I think it would be appropriate to talk a little about how I or anyone else should decide on purchasing a TV box. Shopping for one isn’t the same as shopping for a television set as there are different things to watch out for. Personally, I often pay attention to what the maximum resolution output is for a TV box. I’m aware that 1080p is still the norm but the fact is that more and more people are upgrading to higher-end sets that are capable of 4K UHD and HDR pictures. Any box that can handle all of that will certainly grab my attention. Technical specs are something I always browse but not extensively. You really only need to look at a couple of key categories like onboard memory, RAM, or the processor being used. This helps give a sense of how fast the machine will function when it comes to changing channels or navigating through menus. These days, it’s always important to check whether a TV box has built-in wi-fi. Even if you mainly use ethernet cables, it’s still a nice backup feature to have in case your cable gets busted and you don’t have a wi-fi adapter. Not using an adapter also frees up a USB port, too. Build quality can’t be stressed enough. Even if you look back on all the previous things I’ve mentioned, your device still has to be long-lasting. Power, speed and great internet go a long way but it won’t matter if your machine cans out after just a few weeks or months. Boxes made out of metal are always good, but high-quality plastics will do. Bonus points if a warranty is included or at least available for purchase. With all that said, let’s get into my review of the SkyStream Three TV Box. As the name suggests, this is not SkyStream’s first foray into the world of streaming boxes. The SkyStream One was an impressive new model that got quite a few people’s attention with its slick menus and build design. It was a good choice for fans of the Android OS that wanted all their apps and streaming in one place. 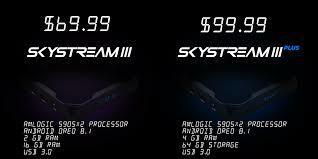 Things changed for the better for SkyStream when they released their second model. The SkyStream Two has only been out for a little more than a year and it is already on many people’s list for one of the best TV boxes out there. It had the works, from high download speeds to a great interface, plus high resolution streaming. Stream thousands of live TV channels and video-on-demand on your Android Box with these IPTV providers. We recommend Insight as a first provider. Amazon Prime members enjoy exclusive access to movies and TV shows, ad-free music, Kindle books, original audio series and unlimited photo storage. Skystream TV: Your TV, Your Way. Watch on all your favorite devices. 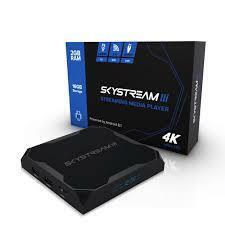 Skystream TV offers Cloud DVR, 7 day replay and plenty of premium channels. Check out their 7-day free trial. The SkyStream Three evolves on its predecessor in only the most logical ways. Each new box acquires an even more attractive look. Each new model gets stronger and more advanced computer parts, and I was told that the SkyStream Three is supposed to have wi-fi strengths that can handle the mountain of information a 4K video provides, though we’ll see about that soon. 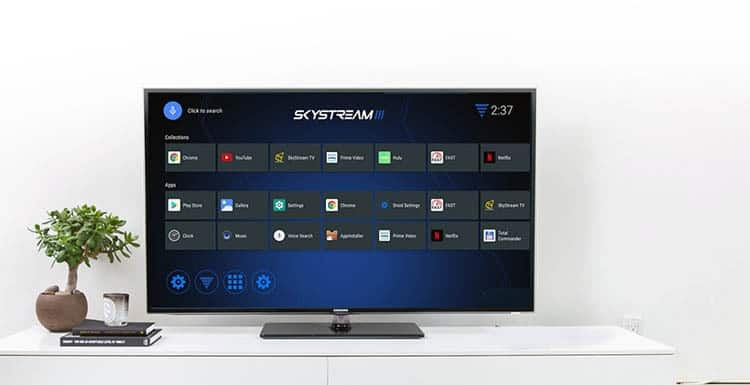 All things considered, SkyStream has made a name for itself over the past few years as being one of the most reliable and technologically advanced Android TV boxes on the market. The first thing that really grabbed my eye about the SkyStream Three Plus was its CPU processor. They’ve fitted a quad-core 2.0ghz model inside of this thing, which is almost overkill. I’ve used TV boxes with dual-core processors that were pretty quick, so I have no doubt that the SkyStream Three is going to dominate in the speed department. Because this is indeed an Android device, it allows you to download apps just like on your own smartphone. SkyStream was smart enough to have sizable internal memory storage. 64 gigabytes of flash memory are on board right out of the box, which means that you can be downloading and installing dozens, if not thousands of your favorite apps, shows, and movies. There is also a micro SD card slot in case you want to transfer things over from your computer or phone, or if you just want even more space. 4 gigabytes of RAM is also extremely powerful for such a tiny box. It’s stats like these that make me think that this box is going to be able to easily handle a lot of rendering and have some impressively short load or buffering times. While the box itself was stylish and easy on the eye, that was nothing compared to what was waiting for me inside the box. It’s interesting comparing the physical designs of all three of SkyStream’s TV boxes. The first two were rather bland looking but the SkyStream Three has undergone some major renovations. It looks like something that should be a part of a high-end gaming PC. The sharp angles and the smooth curved edges give it a somewhat futuristic look. It’s definitely one of the nicest looking TV boxes I’ve ever seen, hands down. Better yet, it seems to fit in with the rest of the electronics in my house no matter where I placed it. SkyStream really hit a home run with these looks. It’s only slightly heavier than other TV boxes, weighing maybe a pound and a half by my guess. It feels robust for its size, though. I certainly have no intention of dropping it but I already get the sense that if I did then it would survive the fall pretty easily. One of the nicest things about this entire package is the new remote control that is included. The previous remote controls were very basic, flimsy and primitive looking. The buttons and the casing just didn’t feel high end at all. SkyStream has pulled a complete 180 with their remotes. This new one is not only nicer looking and feels sturdier but features a keyboard on the back side. This is such a massive convenience for typing in the names of the apps you want to download or the channels, shows or categories you’re browsing to watch. Once the machine was plugged in, I was greeted by blue digital lights telling me the time, just like the good old days on classic cable boxes. It’s small touches like that that really help complete the overall package and experience. As I expected from checking the specs, this baby is fast – really fast. Like with any TV box, you’re going to have to deal with the usual setup process. You might get a firmware update (I didn’t for the SkyStream Three) and then you’ll have to set up your internet, Kodi, streaming service, and your IPTV provider. It all takes no more than a few minutes. After I was done with the usual setup process, I turned off the box so I could see how quickly it would turn on. Every time I turned on the SkyStream Three it took maybe two and a half seconds to boot up to the main menu – pretty fast, as I’ve used other TV boxes with startup times three times as long as the SkyStream Three. That’s the work of that glorious quad-core processor right there. The input delay between pressing buttons on the controller and seeing the actual response on screen is pretty nonexistent. Scrolling from icon to icon feels incredibly seamless. The SkyStream Three has done magnificent work in ironing out any sluggishness or button lag that is customary with TV boxes. Even though I like it when TV boxes have built-in wi-fi, I admit this was the one area about the SkyStream Three I was a little nervous about. Even on great TV boxes, the wi-fi can be a bit spotty. Couple in the facts that the SkyStream Three is capable of 4K Ultra High Definition (four times the data than 1080p) and the fact that it doesn’t have any sort of external antenna and it seems obvious that connection issues might arise at some point. Although I was worried that I was going to be disappointed by the wireless function and just have to rely on ethernet cables, my doubts were proven wrong. I really don’t know how SkyStream has pulled it off, but the built-in wi-fi is very strong and reliable. It has a surprising range and always retains a strong connection to my router. If your internet service plan or bandwidth can support it then you could definitely stream 4K content wirelessly. It is staggering how easily that can be pulled off with the SkyStream Three. Additionally, like all SkyStream boxes, the SkyStream Three is capable of up to 1000MB/s with a wired connection, which again is really nice to have when streaming a lot of content. The built-in Wifi supports 802.11 ac and 5Ghz band for superior connection speeds. It’s hard coming up with something negative to say about the SkyStream Three Plus. An extra SD card slot or USB port? Available in multiple colors? But that’s ultimately just nitpicking. I have to completely admit that the SkyStream Three Plus was even better than I expected it to be, and I thought that it was going to be extremely high quality. It’s too hard to say right now with certainty about whether this is the absolute best Android TV box I’ve ever used – but it is definitely one of the best. This is a near flawless machine that ought to satisfy anyone, whether they are huge into Android apps, or 4K, or lightning fast speeds. This is truly a state of the art TV box and to make everything even better, it is more affordable than other premium Android or IPTV streaming boxes. Whether you are in the mood to upgrade or to get your very first streaming box, I cannot recommend enough the SkyStream Three Plus. 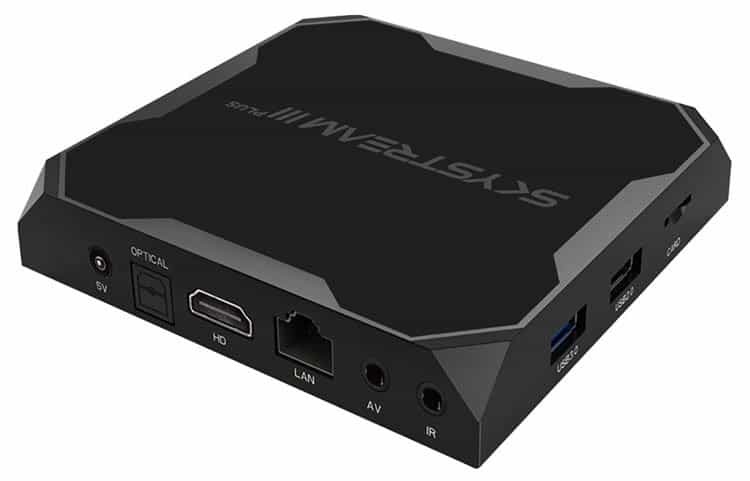 Anyone with a very strong internet connection or a beautiful 4K television isn’t taking full advantage of either of them until they get themselves a TV box like this. Previous Post MAG 322 IPTV Box: Pros, Cons, and Detailed Review Next Post The Best Streaming Services 2019: What’s Out There Other Than Netflix?